Liszt’s image as a virtuoso came from his earlier years in which he toured as the world’s greatest concert pianist, but the brilliant pieces he performed left their mark on his musical reputation. 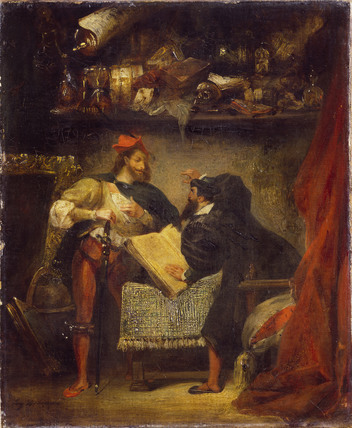 Perhaps this explains his fascination with the Faust legend, the story of a man who sells his soul to the devil in exchange for knowledge, among other things… Liszt’s Mephisto Waltz no.1 describes a scene from Nikolaus Lenau’s version of the legend, in which Faust seduces a girl at a village dance, with the assistance of Mephistopheles and his dangerous violin playing. Although the virtuosity for which he was famed may have tainted Liszt’s reputation as a composer, it was nonetheless a vital component in his compositional development. Liszt favoured the pianos by Erard in nineteenth-century Paris – the technically innovative instruments matched his own developing virtuosity and ability to create new possibilities in sound. Offered here are two recordings of the first Mephisto Waltz– one on the modern Steinway, the other on an Erard piano from 1840. This Erard admittedly predates the piece’s composition by some twenty years (some slight adjustments have therefore been necessary to accomodate the keyboard span), but still gives a fascinating glimpse into Liszt’s own sound world, which points towards, but is still far removed from that of today’s modern grand.